Tawadros II becomes first Coptic Pope in decades to visit Jerusalem, for senior cleric's funeral; Church plays down political significance. 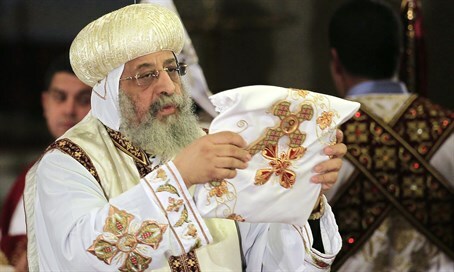 Egypt's Coptic Pope Tawadros II left for Jerusalem Thursday for the funeral of a senior cleric, the first visit by the head of Coptic Christians in decades, a church spokesman said. He will attend the funeral of Archbishop Anba Abraham, the head of the Coptic Church in Israel who died on Wednesday at the age of 73. Egyptian Copts were forbidden from visiting Israel by their late Pope Shenouda III, who was traditionally careful not to provoke an already-hostile Muslim majority in Egypt by being seen to stray from the anti-Israel sentiments of most Egyptians. Shenouda passed away in 2012 after leading the ancient orthodox church for 40 years. His successor Tawadros II has been seen as somewhat more willing to assert himself and the Coptic community in General, throwing his weight behind the army's overthrow of the Islamist government of Mohammed Morsi, and issuing an edict in August banning Copts from joining the Salafist Nour party. But the Coptic Church played down any political significance to this trip. "The visit is to attend the funeral and nothing more," church spokesman Boulos Halim told AFP. "The position of the church remains unchanged, which is not going to Jerusalem without all our Egyptian (Muslim) brothers." Despite the ban, hundreds of Egyptian Copts have visited Israel over the past few years during Easter. While the body of his predecessor was returned to Egypt for burial, Abraham specifically requested a burial in the holy city, according to Halim. "He wrote in his will that he wanted to be buried in Jerusalem," he said. In an interview published on the church's Facebook page, Tawadros said that his attending the funeral was not a visit as much as it was a "human duty." "I don't consider this to be a visit because the word 'visit' means that one prepares it in advance with a schedule and appointments," he said. "I consider this to be a human duty, a condolence duty." Egypt's indigenous Coptic Christian minority - whose presence predates the arrival of Islam and accompanying Arab conquest by centuries - account for around 10% of the total population in the Arab world's most populous country, but have been the target of waves of deadly attacks by Muslim extremists. That was the case particularly after the ouster of Islamist President Mohammed Morsi, when Islamist terrorists and Muslim mobs murdered scores of Copts and burned down many churches and Coptic homes and businesses.